The greater part of bands from Old School Heavy Metal try to catch influences from NWOBHM and from the German scene from the 80’s. It’s hard to find some names going through other ways (yes, they exist; besides it seems that a weird rule is set to make everyone sounds as those movements I mentioned above). 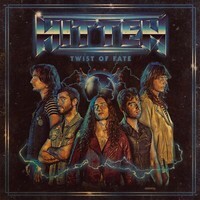 But even taking influences from these scenes, the Spanish quintet HITTEN shows that can do better than many bands from Old School Metal, as their album “Twist of Fate” is here to show. Of course they drink from English and German Heavy Metal from the 80’s, but as well something from JUDAS PRIEST and modern traditional Heavy Metal names as METAL CHURCH, FIFTH ANGEL and CRIMSON GLORY (as the high pitched vocal tunes and screams and technical melodies make clear), so it’s not something new at all, but in their hands, they show that talent they have. And with it, they create something filled with energy and personality, something that seduces the listener. The production, as the greater part of bands from this same Metal genre, tries to be as those from the past. Yes, it’s raw and trying to be as organic as they can, to match on those models from the past. And they don’t need to do it in this way, because something modern would fit in their work perfectly. It was a matter of evading endless editions. But if the production failed, their music is truly amazing. The excellent rhythmic work of “Take it All” (hear as bass guitar and drums sets a heavy rhythm), the Hard ‘n’ Heavy outfit of “Final Warning” (great guitar riffs and duets), the catchy harmonies of “Twist of Fate” (excellent chorus and fine vocals and backing vocals), the fine musical arrangements of “Flight to Freedom”, the seductive energy presented on “On the Run”, the Classic Rock touches heard on “In the Heat of the Night”, and the abrasive feeling created by guitars on “Heroes”. HITTEN has a lot to offer, and just setting things in a better form on the production on the next album, and everything will be alright. For now, “Twist of Fate” is truly a fun album to hear.